Guitar driven hard rock that literally makes me want to crank it up, roll the windows down, and drive around town! 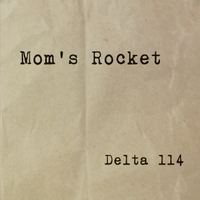 Delta 114 is all about Mom's Rocket going back to their roots. This record delivers straight forward crushing guitar tones, solid rhythm section underneath, and arguably the best vocal work singer Tom Roney has ever done. These songs are captivating and soulful while at the same time delivering a driving energy that rocks!